Spring has finally arrived, with thundershowers today. The rain was nice because it washed away a lot of the pollen. Unless you live in the area you just can't imaging how much pollen is in the air and on the ground. Today before the storm the wind picked up and the pollen was being blown into drifts on the front porch. After the rain, it collected in the street. Puddles of yellow goo a 1/4 inch thick. 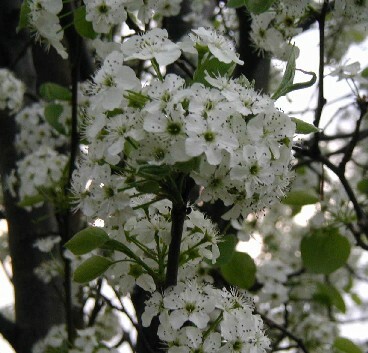 Dear Mr. Gregorio: My comment has nothing to do with technology, except to say how well I can see the spectacular photo of Bradford Flowering Pear you have on your Bitworking site.